Locals fear urinals, installed 20 metres from school "incite exhibitionism"
A journalist poses in front of a bright red, eco-friendly urinal. A new set of eco-friendly but completely exposed urinals deployed on the streets of Paris are provoking uproar from locals. 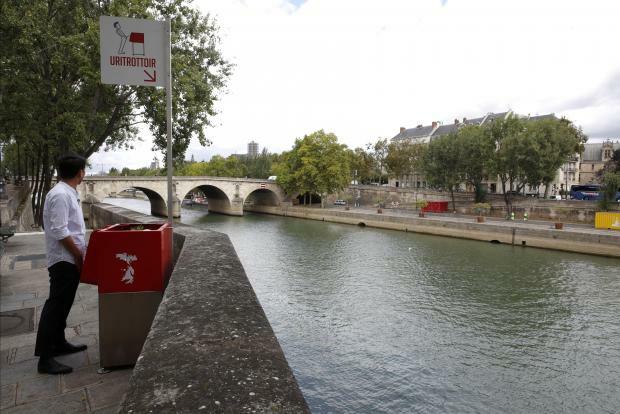 One of the bright red "urinoirs" installed on the Ile Saint-Louis, not far from Notre Dame cathedral and overlooking tourist boats passing on the Seine, has caused particular indignation. Locals have written to the town hall to demand its removal and are planning a petition. "There's no need to put something so immodest and ugly in such an historic spot," said Paola Pellizzari, 68, owner of a Venetian art store. "It's beside the most beautiful townhouse on the island, the Hotel de Lauzun, where Baudelaire lived," she said, referring to the 19th-century French poet. The designer of the "Uritrottoir" - a combination of the French words for urinal and pavement - said it offered an "eco solution to public peeing". The device is essentially a box with an opening in the front and a floral display on top, containing straw which transforms into compost for use in parks and gardens. But Ile Saint-Louis locals said the receptacle, with no stall around it of any kind, could blight their ultra-chic neighbourhood. "It's horrible," said the 50-year-old owner of a nearby art gallery, who declined to give his name. "We're told we have to accept this but this is absolutely unacceptable. It's destroying the legacy of the island. Can't people behave?" Local mayor Ariel Weil insisted the devices were necessary, however. Paris authorities have rolled out four of the stand-up loos in spots where public peeing has been a problem, and a fifth is planned. "If we don't do anything, then men are just going to pee in the streets," he said. "If it is really bothering people, we will find another location." Some have even branded their installation discriminatory. "They have been installed on a sexist proposition: men cannot control themselves (from the bladder point of view) and so all of society has to adapt," said Gwendoline Coipeault of French feminist group Femmes Solidaires. "The public space must be transformed to cause them minimum discomfort." "It's absurd, no one needs to urinate in the street."